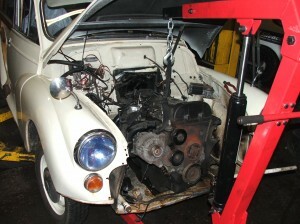 The Morris minor having a zetec engine fitted is close to completion. Cooling systems, fuel system, exhaust, gearbox mounts, chassis mods to fit the starter and many other small jobs are all hugely time consuming but progress is slowly being made. There’s a few more small jobs then the car needs switching over to negative earth and the ECU needs fitting and programming. We can finally start looking forward to the maiden voyage! 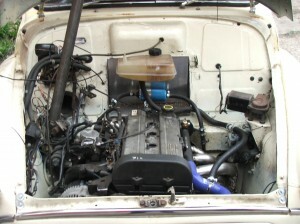 It might not look like much has happened on the moggy but there’s hours of work happened to get the zetec engine to fit. 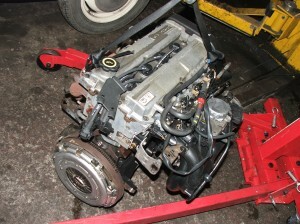 It’s now been mated to the type 9 gearbox and all of the associated clutch issues dealt with. 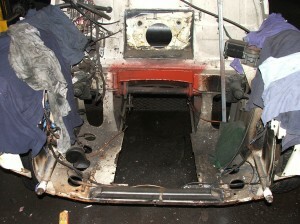 Engine and gearbox mounts have been made and some more chassis work done to accomodate the final assembly. The radiator just fits into the front panel so now we have lots more fianl dressing of the engine bay and then the endless task of wiring and piping. Next on the build list is the prop and exhaust manifold! If you have an old classic and love the character but get tired of the gasping little engine you have 2 options. 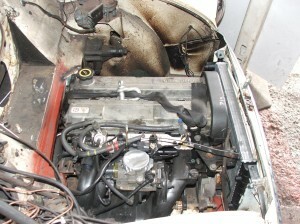 Modify the engine which may cost a lot to return a little or modfiy the car the take a better engine. I favour plan B as did our customer when he brought in his Morris Minor. 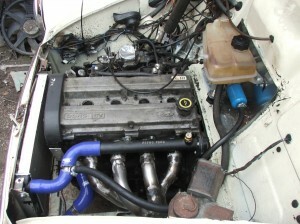 Various options were discussed but a Ford Zetec 2.0l from a Mondeo was the power plant of choice. Rear wheel drive conversions with this engine are well documented and it’s a nice tractable and readily available engine so all we had to do was work out how to make it fit! There were a few small problems such as the steering rack being in the way and the engine bay not being long enough but as each challenge develops so do the solutions. It’s lovely watching a project like this grow. There’s still a long way to go but here’s a few snaps of the story so far.